The ‘Pink City’ of Rajasthan or Jaipur is a major tourist destination of the country, which have grand Rajput palaces, forts, cultural ethnicity, princely ambience and amazing colorful markets, scattered everywhere around. The Pink color makes the city look more beautiful and it let the people attracts towards to the perfect combination of the city with color and its traditional beauty. Jaipur embraces a royal past drenched completely in extravagance. All these places are the bookmarks of the erstwhile traditional era, where royalty was once lived with complete power. In the hearts of the Rajasthani people one can feel the essence of the rich and diverse culture of Rajasthan. With the increasing globalization, the people of Jaipur are still attached with their values and rituals that allow them to signify and share the unique fusion which melts with the people in the front.In terms of music, Rajasthan is still very traditional. There are many folk songs which can be heard in every season and that can suit every mood. Incredible folk songs are just stunning. In early days, these folk songs were a source of entertainment not only by common people but also by Royal families. Along with modernity, the heritage of Rajasthan is still alive. Puppet shows of Jaipur are very famous and these shows are incomplete without songs. Puppets made of wood are colored and decorated in the Rajasthani style to make them beautiful and colorful. Puppet shows are displayed in traditional style and the characters vary in several numbers. Traditional musical instruments like ghungroo, Sarangi and ektara shows a real mix of Royal Rajasthan. Apart from traditional music, modern music is also played here. Jaipur has many pubs and discos to add beauty and rhythm to the Pink City. Famous Bollywood Dance classes are also offered by famous professional dance teachers. Government is also taking steps to promote music and dance in the city. Jawahar Kala Kendra is the only place by the state government where several drama, dance and music activities take place. There are shocking performances by dancers on smashed glasses or by using dance on sharp swords or doing dances on the edge of the glass. The traditional desert culture of Rajasthan has been largely influenced by dances and music. Modernization is to an extent in Jaipur along with the traditional culture. The beats of Westernization and the rhythm of traditional melody show a real amalgamation of the old and the new. Taal Bandi and Dangal of earlier times has now become popular under the rival of Kalangi and Turru banners. Dangal or Taal Bandi is a group singing by classical bandishes. In Royal times as well, Bhopas used to sing in the praise of deity and the emperors. In some of the cultural shows the main artists along with their female companions recites the Phads. Phad is a painted form of Ballad which is skillfully woven art works and these are placed in several museums as Phad paintings. Many traditional artists move from village to village to perform their art and nukkad nataks. Great ballads of Nihalde Sultan, Shivji – ka- bywala and bhajans of Bhartihari, Gopi Chand, Teja ji are the famous recitings by the Jogis. Each community has their own style of music whether it will be the Dholies or Mirasis, Dhadies, Manganiyarv and Langas. Ballads are commonly known as Maands which are based on the epics like the Ramayana, the Mahabharta. Other famous ballad includes Doongji- Jawarji, Dhola Maru, Moomal Mahendra, Gagaleng, Nagji Nagwanti. These all are based on the themes of love, separation, passion and are true to their Motherland. The famous folk of Jaipur is Tamayha. The famous traditional music instruments of Rajasthan are Naad, Sarangi, Rawanhatta, Algoza, Morchang, Khartal, Bankia, Poongi, Kamayacha and Da. Music of each area of Jaipur is different from the other. 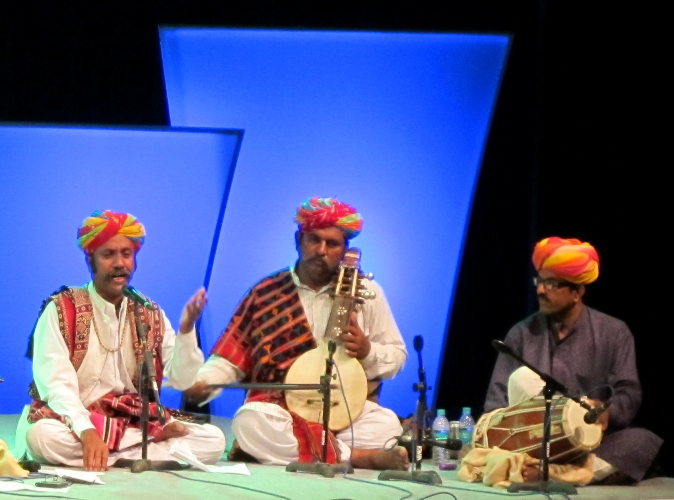 Rajasthani music does not require any introduction. The beautiful dance performances require a lot of hard work and practice. The artist wears beautiful jewelry and ornaments, colorful dresses and follows various stunts. Plan a trip to Jaipur and get delighted with the rustic songs and folk dances in the backdrop of Pink City.